Confidence is a student’s passport to a lifetime of mental health and social happiness. It is the foundation of a student’s well-being and the key to success as an adult. At all ages, how you feel about yourself affects how you act. When a student feels good about himself, he finds it much easier to get along with others and feel good about them as well. person he sees. He looks inside himself and is comfortable with the person he sees. He must think of this self as being someone who can make things happen and who is worthy of love. Lack of a good self-image very often leads to behaviour problems. Most behavioural problems come from poor self-worth in parents as well as students. How people value themselves, get along with others, perform at school, achieve at work, and relate in marriage, all stem from the strength of their self-image. Throughout life, a student will be exposed to positive influences builders and negative influences breakers. 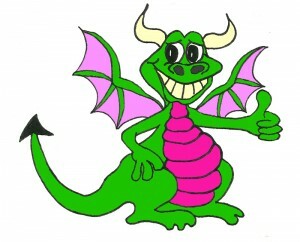 Where dominant adults are unfortunately a breaker, the Power Dragons instructor will be a builder. 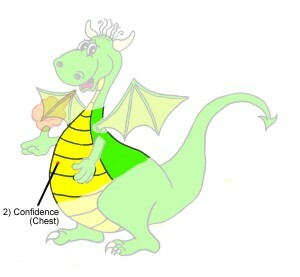 When the student demonstrates that he has mastered the characteristic of Confidence, he will be awarded a part of Dave the Dragon for his workbook. The part of Dave the Dragon representing Confidence is the chest. Confidence comes from within us, from our heart. Like our heart, it is critical to keep us strong and healthy.